Summer officially begins in two days! I don’t know about you, but I’ve already been out enjoying the longer days, sunshine and warmer weather! To me, Summer is all about being outdoors, having fun with friends and family, and eating good food at BBQ’s and group gatherings! 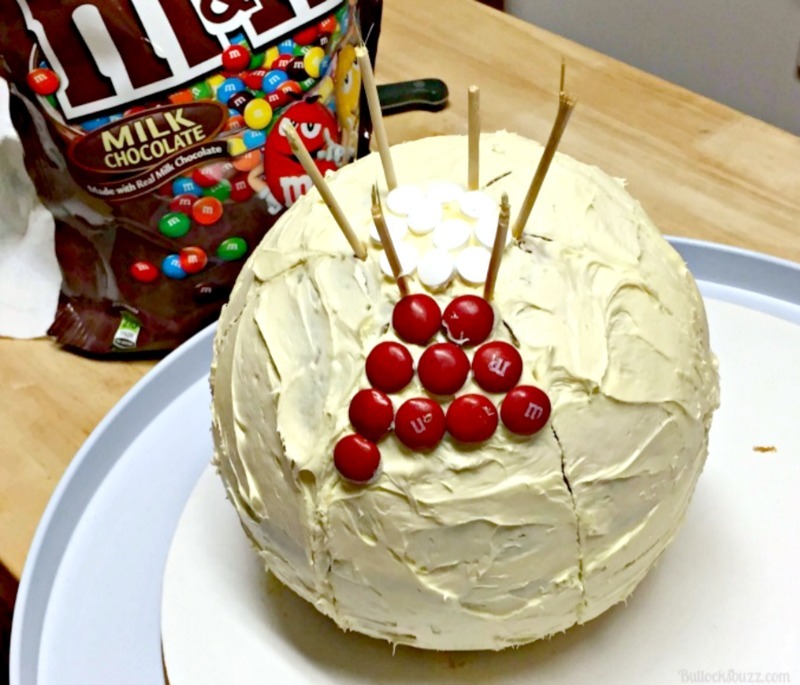 Speaking of good food, just wait until you try this delicious cake that’s made with everybody’s favorite candy-coated chocolates, M&M’s®! 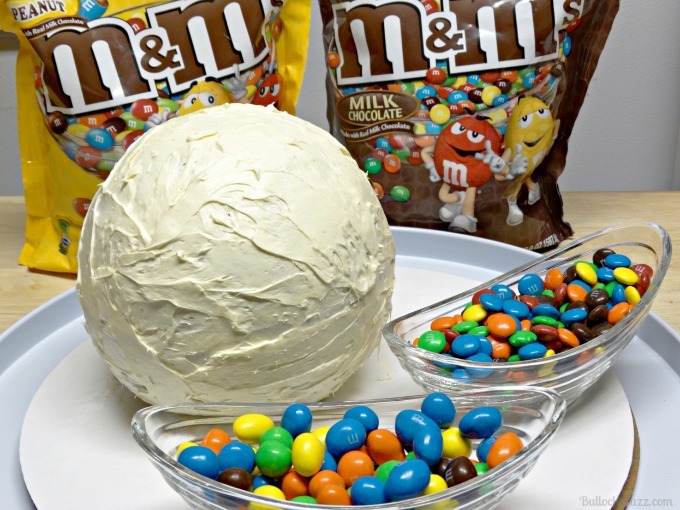 Most of the time less is more, but when making this delectable M&M’s® Beach Ball Cake, the opposite is true! 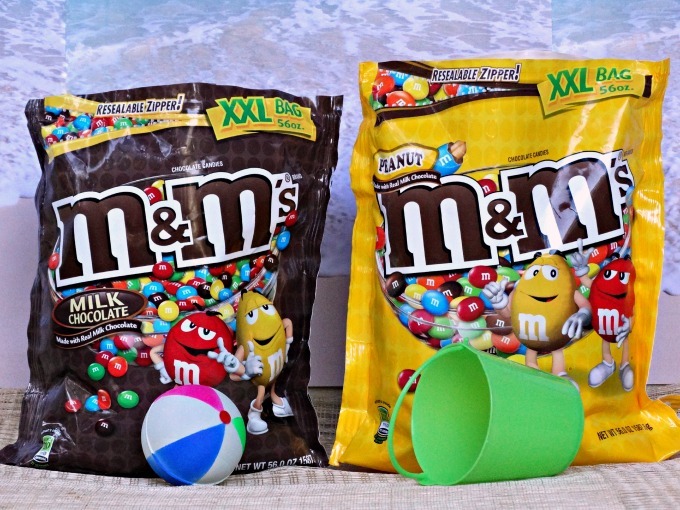 You are going to need a lot of M&M’s® to cover the entire cake, and I found that the XXL bags are the perfect size. In fact, these 56 ounce bags are big enough to last you all summer long – just think of all of the tasty treats you can make! They are also the perfect size for summer parties and gatherings, too! 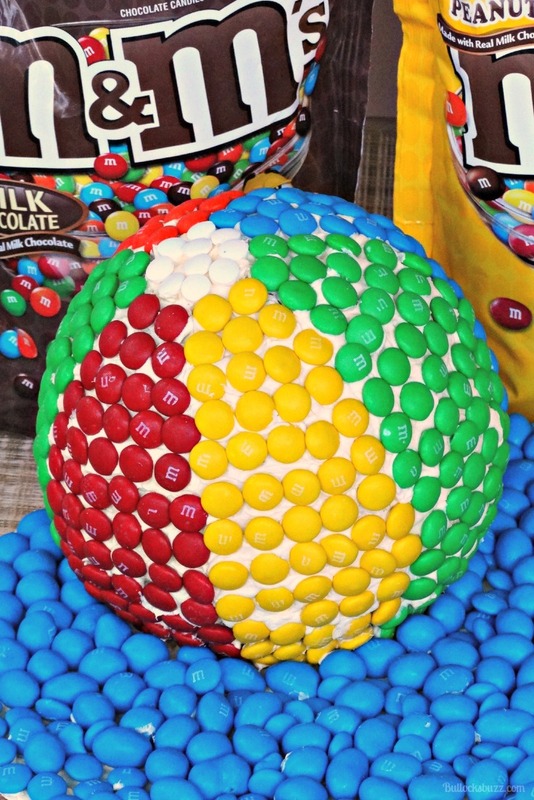 Ready to see how to make this M&M’s® Beach Ball Cake? First you will need to prepare the molds by greasing and flouring. Once the pans are ready, begin making the cake, following the instructions on the box. Although you need to use both boxes, you will have some batter left over. I had enough to make a another small sheet cake (another use for all those tasty M&M’s®)! Once the batter is ready, fill each hemisphere at least 3/4 of the way full (the cakes need to rise to the rim and over a little bit). Place both pans in the oven on top of a cookie sheet and bake at 325° for anywhere from 35 to 50 minutes, or until a wooden skewer inserted in the middle of each mold comes out clean. Keep in mind these will take longer to bake than a regular sheet cake. 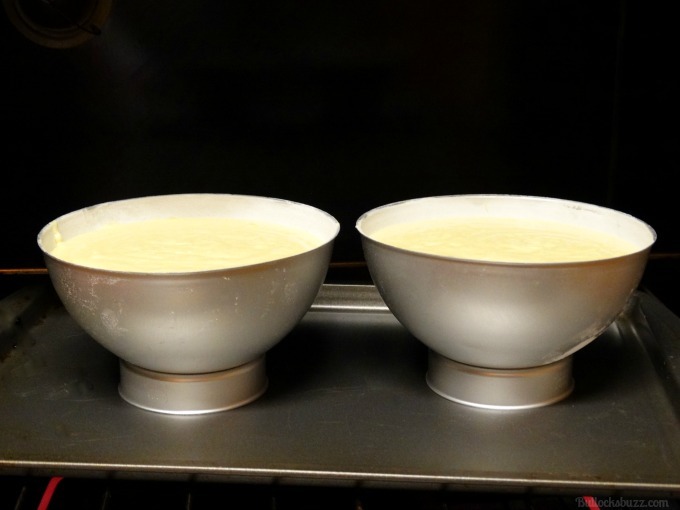 Once the cakes are finished, leave them in the molds until they have completely cooled. I chose to refrigerate mine overnight, although you do not have to. When the cakes are cool, and before you remove them from the tins, use a serrated knife to slice the tops off each half so that they are even with the rims of the molds. You should now have two perfect halves of a perfect ball. Gently remove the cakes from the tins. Lay them both flat side down. Now take one of the halves, and cut off a little part of the dome in order to create a flat base for the cake to rest on. This is a good time, if you have one, to place your cake board on a cake turntable (I actually used a Lazy Susan). Spread a little bit of buttercream frosting on the cake board, take the half that you just trimmed and position it on top of the buttercream, trimmed side down. This will act as a glue to hold the cake in place. Now spread a layer of buttercream on the top of the half you just placed on the cake board. Don’t go crazy with it, but add enough so it will effectively hold the two halves together. I also chose to insert three wooden dowels to act as extra support, making sure they were cut to the needed length before inserting them. 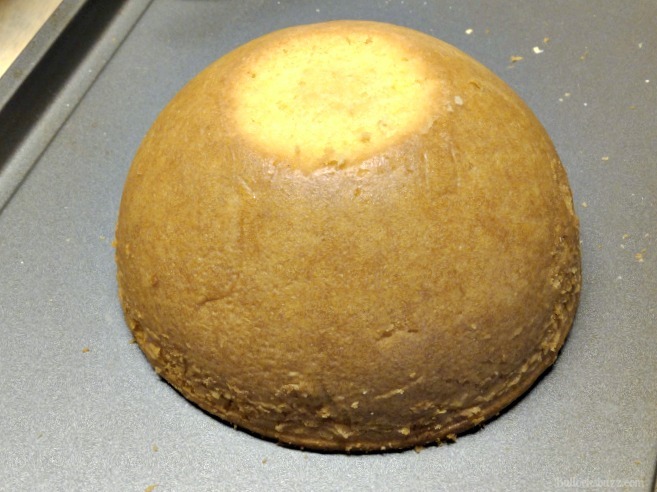 Now gently position the other half of the cake on top, and carefully press them together until a sphere is formed. 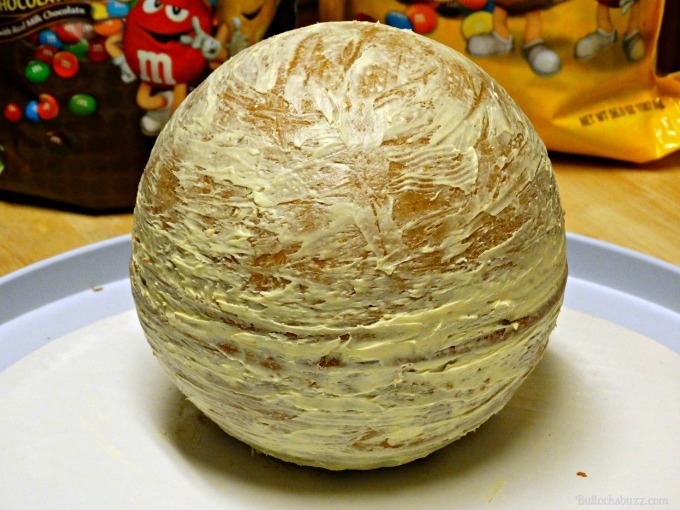 Once you have the sphere assembled, take some frosting and give the entire cake a thin crumb coat. This is basically a thin layer of frosting that works to hold in most of the crumbs so you will have a nice, smooth surface to frost. After applying the thin crumb coat, place the cake in the refrigerator for about 45 minutes so the frosting will set. When your crumb coat is nice and firm, add another layer of buttercream all around the cake, making sure it is thick enough to hold the candies. Now the fun part…adding the M&M’s®! This is also the part that will take the longest – and the most patience! I used the M&M’s® Original for the entire cake, and then used the M&M’s® Peanut for the ‘water’ around the cake. 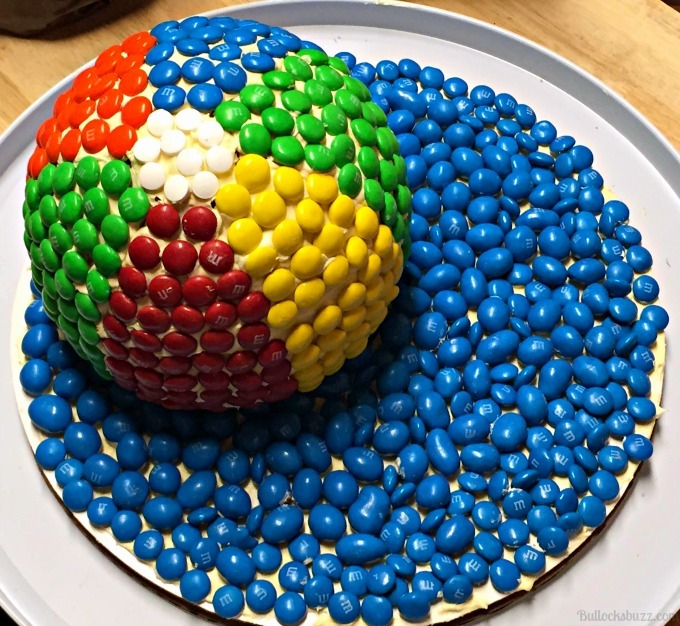 Begin by making a small circle on the top of the ball with whatever color M&M’s® you choose (I actually used some white candies I had leftover from Valentine’s Day). Next, place six toothpicks, equal distance apart, around the outside of the circle. 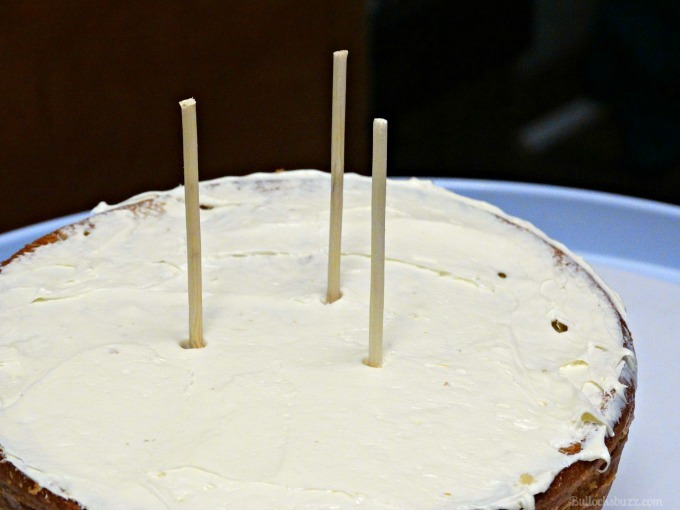 Then, using another toothpick, ‘draw’ a gently curved line in the icing running from each toothpick down to the bottom of the cake (using these guidelines to mark each section makes it much easier to get the proper design). Once the guide lines are drawn, remove the toothpicks. 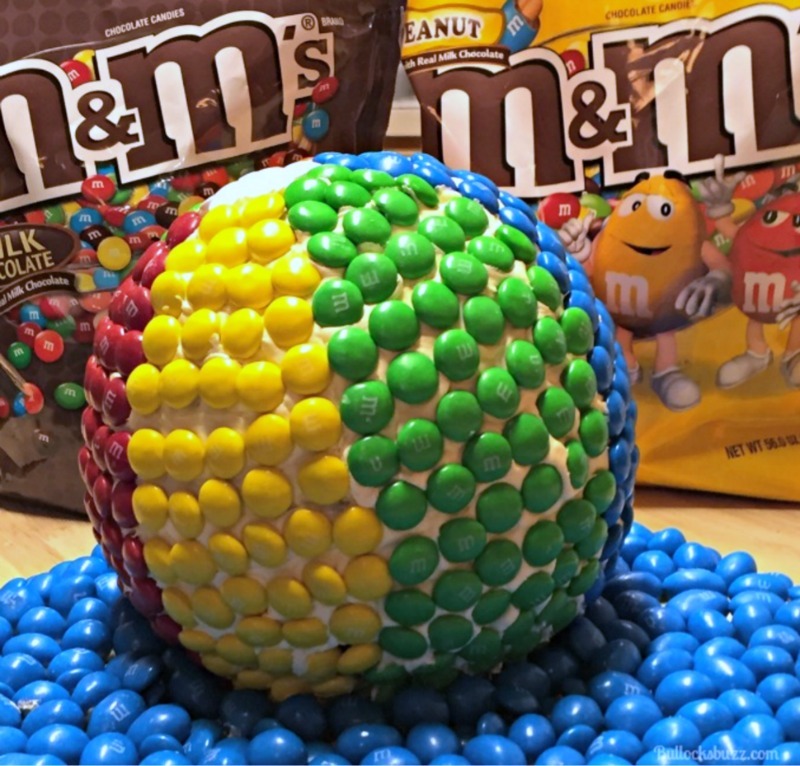 Begin adding the colored M&M’s®. At first I tried filling in one color at a time (like in the above picture), but I soon realized that was not going to work. Instead, the best way to do it is to start at the top of the cake and add one row at a time, working your way around the circumference of the cake, switching colors as you go. So in other words, if you begin the row with red, when you get to the next section, switch to the next color, and so on all the way around the cake. Continue in that fashion until the entire cake is finished. Once the cake is completely covered, the last step is to add the “water” around the cake. Use the blue M&M’s® Peanut for this, and fill in any holes with the blue M&M’s® Original. 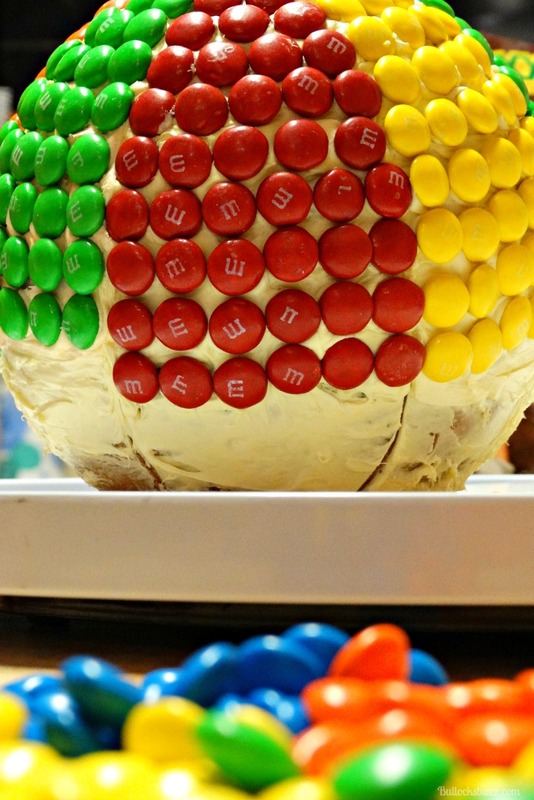 Tip: spread a thin layer of frosting around the cake board, so the M&M’s will remain in place instead of rolling all around. Once the ‘water’ is finished, place the cake in the refrigerator for a few hours or even overnight so the frosting and candy will set. Then cut, serve and enjoy! 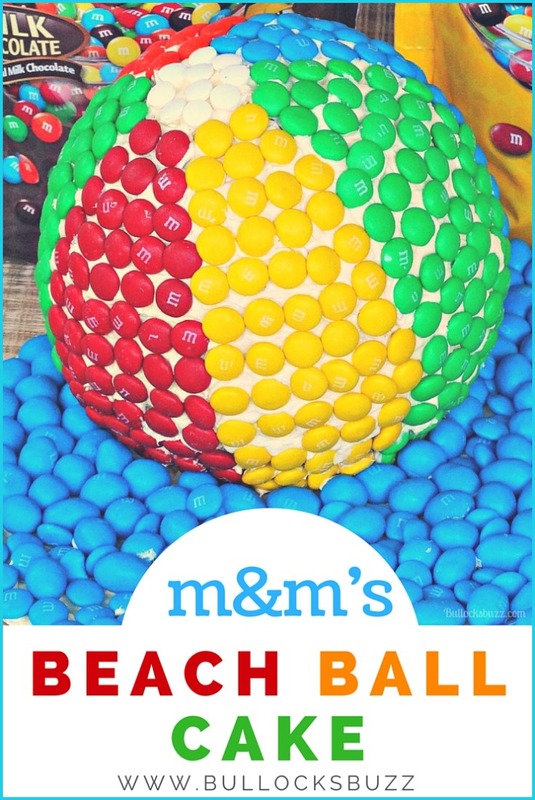 So there you have it – a fun and delicious M&M’s® Beach Ball Cake that is perfect for get-togethers, birthday parties, bbq’s and all sorts of summertime fun! 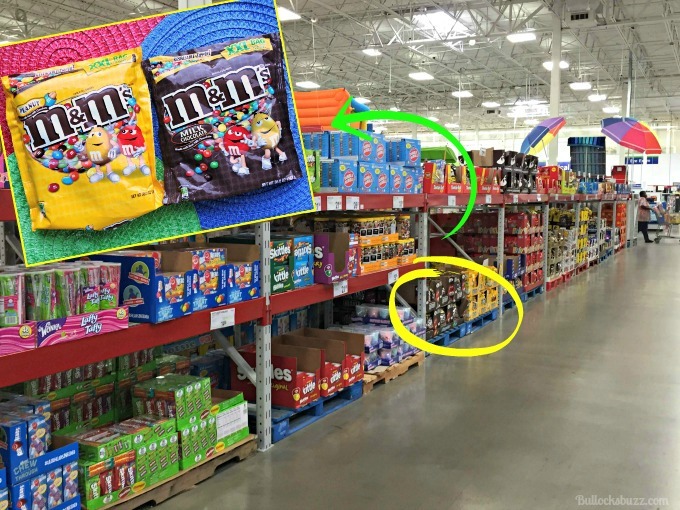 You can find the XXL bags of M&M’s® on the candy aisle at your local Sam’s Club. Choose from M&M’s® Original, M&M’s® Crispy, and M&M’s® Peanut varieties, or grab all three! Share a little Funshine this Summer! Do you have a favorite recipe using M&M’s® that you like to make? #ShareFunshine by telling us about it in the comments below! This cake is amazing, Alaina! So perfect for all those summer parties! Can’t wait to try this, as making red frosting for the ball is a pain. Question: How did you cut it? I would love to see how yours turns out! As far as cutting, well that was interesting to say the least. LOL! We started to cut into it just like a regular cake but it didn’t look as though that was going to work out too well. So we wound up slicing a bit off the top to locate the dowels, removed those and then separated the cake back into 2 half spheres. We then laid each half on a large plate, and cut it into slices from there. 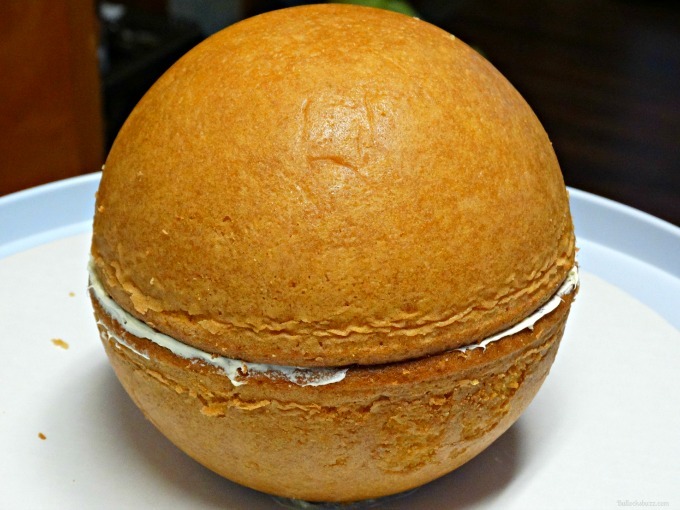 I’m sure there is an easier way, but this being my first time to make a sphere cake the entire process was a learning experience. Once you make yours, please let me know if you figure out an easier (and less messy) way! Thank you!! It was much easier than it looks! What an adorable idea! What size were your hemisphere pans? I’m going to try this for my grandson’s birthday. Thank you for the tutorial! Thanks Debbie! 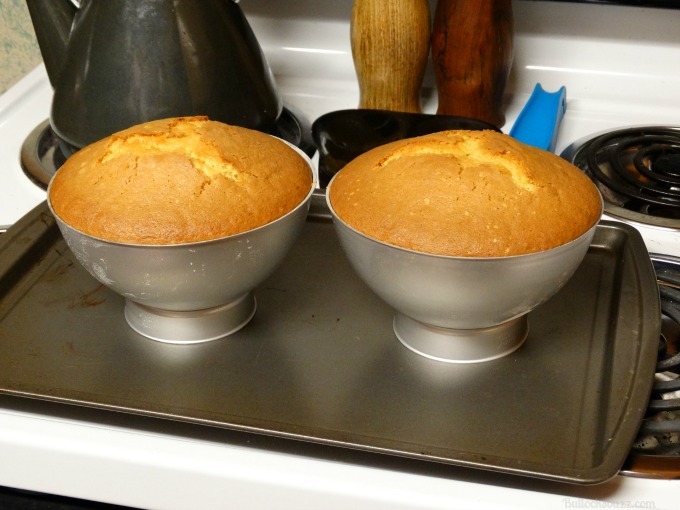 The pans I used were 6″ – small enough to make it easy, but surprisingly plenty of cake!  You can find the one I used here: http://amzn.to/2qdgXsy (this is an affiliate link so if you make a purchase, I will make a small commission but at no extra charge to you).Let me know how it turns out – love to see a pic! Thank you! I do have some more that I’d be happy to submit! I’ll do so this weekend.